1. You feel as though you are emotionally volatile. One of the simplest and most effective forms of manipulation is guilt. Manipulators love to make their victims doubt and even hate themselves because it removes all credibility and self confidence, making it easier to control you. Self loathing often leads to emotional instability and volatile sensitivity. Once you remove the manipulator from your life, you will find a sense of security and stability returns almost immediately. 2. Your relationships with others are suffering. It often happens at such a gradual pace that you hardly notice, but you may wake up one day to realize that you’ve almost completely withdrawn from friends and family outside of your relationship. This is a classic tactic of manipulators. It allows them to get away with unacceptable behaviors that outsiders might notice and call to your attention. Most of the time these friends and loved ones are still ready and waiting to hear from you. Try reconnecting, you’ll likely get an excellent response. 3. You have a warped, negative sense of self. Manipulators tend to be extremely dominant and overbearing in more ways than one. It’s incredibly easy to shrink down and end up living in the shadow of your manipulator without realizing it’s happened. As soon as that aggressively dominant personality is gone, you’ll find yourself feeling the sun again. Stand tall and strong in who you are. 4. You find you’ve forgotten or left behind things you once enjoyed. 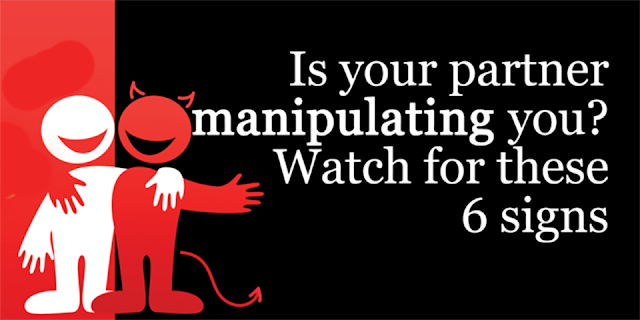 Manipulators do what they do because they have an insatiable need for your constant attention. They want you to be fully focused on and invested in them at all times, which means that they will do or say anything necessary to pull you away from hobbies, interests and passions that may distract you. When you leave them, you suddenly remember all of the things that you once loved devoting your time and attention to. You will be free to do things that make you feel good, as opposed to making someone else feel good all the time. 5. You can’t remember the last time you felt at peace. Manipulators need you to be in a constant state of worry and stress. It’s how they hold you hostage and keep you from gaining the strength to stand up to them. They will put a great deal of effort into simply keeping you in disharmony so that you will stay where you are instead of getting clarity and breaking away. Don’t worry, all it takes is one moment of a clear perspective, and you will see the shining possibility of what your life could be without them. Inner peace will find you once the manipulator is no longer controlling you. 6. You feel like there is no one you can trust. Again, a manipulator thrives off of tearing you down in any way they can. This includes making you feel as though no one will believe you if you try to talk about their toxic behavior, and convincing you that they are the only person in the world that you can trust in at all. After being in a relationship with someone like this, there will be damage and trust is one of the most difficult things to rebuild, but it can and it will happen. It may take time, but you will begin to trust again. Be patient, it will get better.